“Yellow mustard” redirects here. For the condiment, see Mustard (condiment). For the North American plant, see Guillenia flavescens. For Mustard White butterfly, see Pieris oleracea. 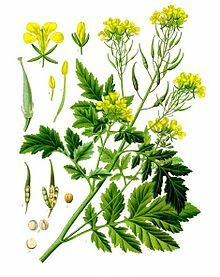 White mustard (Sinapis alba) is an annual plant of the family Brassicaceae. It is sometimes also referred to as Brassica alba or B. hirta. Grown for its seeds, mustard, as fodder crop or as a green manure, it is now widespread worldwide, although it probably originated in the Mediterranean region. White mustard is an annual, growing to 70 cm high with stalkless pinnate leaves, similar to Sinapis arvensis. Most common in Europe, North Africa, the Middle East and Central Asia, it can be found worldwide. It has been found as far north as Greenland, and naturalized throughout Great Britain and Ireland. The yellow flowers of the plant produce hairy seed pods, with each pod containing roughly a half dozen seeds. These seeds are harvested just prior to the pods becoming ripe and bursting. White mustard seeds are hard round seeds, usually around 1.0 to 1.5 mm (0.039 to 0.059 in) in diameter, with a color ranging from beige or yellow to light brown. They can be used whole for pickling or toasted for use in dishes. When ground and mixed with other ingredients, a paste or more standard condiment can be produced. Sinapis alba is used to make the commonplace yellow table mustard, with additional yellow coloring provided by turmeric in some formulations. The seeds contain sinalbin, which is a thioglycoside responsible for their pungent taste. White mustard has fewer volatile oils and the flavor is considered to be milder than that produced by black mustard seeds. In Greece, the plant’s leaves can be eaten during the winter, before it blooms. Greeks call it vrouves (βρούβα) or lapsana (λαψάνα). The blooming season of this plant (February–March) is celebrated with the Mustard Festival, a series of festivities in the wine country of California (Napa and Sonoma Counties). White mustard is commonly used as a cover and green manure crop in Europe (between UK and Ukraine). A large number of varieties exist, e.g. in Germany, Netherlands, mainly differing in lateness of flowering and resistance against white beet-cyst nematode (Heterodera schachtii). Farmers prefer late flowering varieties, which do not produce seeds, as they may become weeds in the subsequent year. Early vigour is important to cover the soil quickly and suppress weeds and protect the soil against erosion. In rotations with sugar beets, suppression of the white beet-cyst nematode is an important trait. Resistant white mustard varieties decline nematode populations by 70-90%. ^ Beesley, S. and Wilde, J. 1997. Urban Flora of Belfast. The Institute of Irish Studies and The Queen’s University of Belfast. ISBN 0-85389-695-X. ^ Balke, D. (2000). “Rapid aqueous extraction of mucilage from whole white mustard seed”. Food Research International. 33 (5): 347–356. doi:10.1016/S0963-9969(00)00055-7. ^ Tan, S. H. (2011). “Extraction and residual antinutritional components in protein fractions of Sinapis alba and Brassica napus oil-free meals”. 17th Australian Research Assembly on Brassicas (ARAB). Wagga Wagga, NSW: 107. ^ Garland, S. (1993). The Complete Book of Herbs & Spices: An Illustrated Guide to Growing and Using Culinary, Aromatic, Cosmetic and Medicinal Plants. Frances Lincoln Limited, Rydalmere, NSW, Australia. ISBN 978-0340584699.
http://www.maltawildplants.com/CRUC/Sinapis_alba.php Comprehensive profile for Sinapis alba.